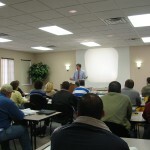 Our instructors are experts in the field of property valuation and are experienced educators. They have a thorough knowledge of the material they teach. They are trained to present the material in a manner that will help students receive the highest benefit from the courses.